Laparoscopic surgery for colorectal cancer has spread globally. The usefulness of laparoscopic surgery for elderly patients was initially indicated by comparison with open surgery. However, whether the procedure is safe for elderly as well as non-elderly patients with colorectal cancer remains unclear. In this review, patients aged ≥ 75 were defined as elderly. We conducted literature searches using PubMed, Scopus, and the Cochrane Central Register of Clinical Trials. Two authors independently reviewed resultant articles to identify relevant observational studies. Data synthesis was performed with a random-effects model. Heterogeneity was investigated by using forest plots and I2 statistics. Risk of bias of included studies was assessed by the Risk of Bias Assessment Tool for Nonrandomized Studies. Publication bias was assessed by funnel plots. Twenty-two studies were included. The incidence of overall complications was slightly higher in elderly patients than in non-elderly patients, with statistical significance (risk ratio (RR) 1.20, 95% confidence interval (CI) 1.08–1.34). There was no difference between them in the incidence of anastomotic leakage (RR 1.24, 95% CI 0.86–1.80) and mortality (risk difference 0.00, 95% CI − 0.01 to 0.01). 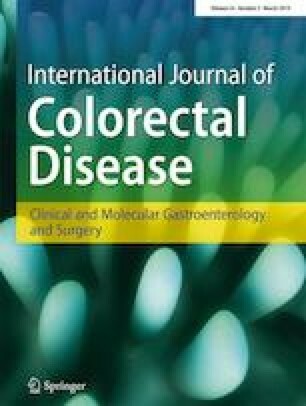 Laparoscopic surgery for colorectal cancer is mostly safe for elderly patients as well as non-elderly patients. Preoperative comorbidities or poor physical capacity should be cared for in the elderly. This review was supported by the Japan Society for the Promotion of Science. This review was funded by the Japan Society for the Promotion of Science (grant reference number: 16K10538).